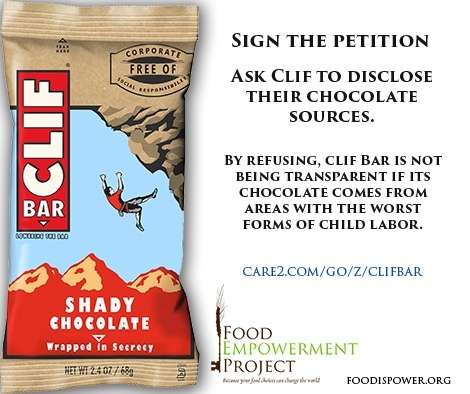 petition: Clif Bar: Raise the Bar on Child Slavery! Clif Bar: Raise the Bar on Child Slavery! Isn't it disappointing when a "socially responsible" company refuses to be transparent? We at Food Empowerment Project have long enjoyed the products from Clif Bar & Company, including energy bars that contain chocolate. But when we asked Clif last year, "From which countries do you get cocoa beans?" they refused to tell us. With some 1.8 million children in Ghana and the Ivory Coast toiling in the chocolate industry--where they may be exposed to the worst forms of child labor, including hazardous work and slavery--we as consumers have the right to know. Many chocolate companies -- including Newman's Own -- disclosed to us where their cocoa beans come from, so what does Clif Bar have to hide? We are not asking for full supply chain information or grower names -- simply the cocoa beans' country of origin. 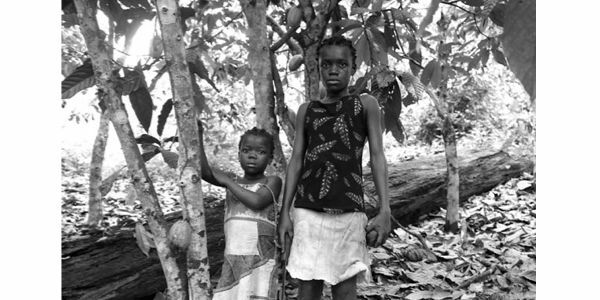 Plantations in Ghana and the Ivory Coast together supply 70 percent of the world's cocoa. For years, these farms have used child slaves, who work 12 hours a day. They cut cocoa pods from trees with heavy machetes, slice the pods open, scoop out the beans, and put them in the sun to dry. Then they stuff the beans into bags and load them onto trucks bound for the United States and Europe. Children are not paid, they are cut off from their families, and when they don't work fast enough, they are beaten. Clif Bar acknowledges on their website "that food matters to our families, our communities, and our planet -- as our food choices affect the physical, social, and environmental fabric of our lives." They even pledge a commitment to communities worldwide. Yet this now all seems to be empty rhetoric. Recently, Clif Bar announced that they intend to use the Rainforest Alliance certification, a system that imposes the least amount of requirements on the companies that plan to use its seal and does not guarantee the cocoa is free of child labor or slavery. While we appreciate Clif Bar's effort, our question remains the same: Where do you source your cocoa from? How could a company that prides itself on social responsibility choose to not be transparent about an issue as important as child slavery? Please join us in asking them. As a compassionate consumer who is vehemently opposed to slavery in all forms, I was deeply disappointed to learn that your company refuses to disclose the country from which you source your chocolate. You are undoubtedly aware that some 1.7 million children are the victims of human trafficking and slavery in the West African nations of Ghana and the Ivory Coast, which together supply about 70 percent of the world's cocoa beans. I understand that the nonprofit Food Empowerment Project has reached out to you asking that you reveal where the cocoa beans you use for your chocolate come from. They are not asking for full supply chain information or grower names -- just the cocoa beans' country of origin. Many other companies, including Newman's Own, publicly disclose where their cocoa beans come from. Unfortunately, your plan to use Rainforest Alliance certification isn't good enough. I need to know where your cocoa comes from so I can make an informed decision. You've pledged a commitment to communities worldwide -- now show us this isn't just an empty promise of social responsibility. SUCCESS! Clif Bar has disclosed the source of its cocoa! Its cocoa is sourced from Cote D'Ivoire, the Dominican Republic, Ecuador, Ghana, Indonesia, Peru, and Tanzania. Thank you to all who signed and shared the petition! It's thanks to your efforts that we won!